Work by AIEA members was featured in the April 21, 2019 issue of University World News . AIEA Member JY Zhou authored the article "How to engage faculty in curriculum internationalisation," while member (and 2019 Klasek Award recipient) Hans De Wit contributed to the featured editorial, "Internationalisation in Higher Education for Society." AIEA member Elaine Meyer-Lee delivered a plenary lecture entitled “The Value and Pedagogy of Global Learning for 21st Century Students" to mark the opening of the two-day conference "Global Education for All: Renewing Our Vision" at Goshen College. Congratulations to all the AIEA member institutions awarded NAFSA's 2019 Senator Paul Simon Award for Campus Internationalization! Among the honorees of the 2019 Simon Award for Comprehensive Internationalization were Kirkwood Community College, Miami University, and West Virginia University. The 2019 Senator Paul Simon Spotlight Award was given to SUNY Buffalo State (for the International Professional Development Schools Consortium), the University of Evansville (for UE Builds: Local and Global), and Virginia Tech (for the Rising Sophomore Abroad Program). An article entitled "Commercialization of Internationalization: Context, Trends, Limits, and Dangers" by AIEA Past President John Hudzik was included in the March 2019 NAFSA Senior Fellows publication Internationalization in a Time of Disruption. AIEA Past President Sabine Klahr and AIEA member Hilary Landorf co-authored the article "Global Learning Inspires College-Level Mathematics" in the January/February 2019 edition of AAC&U News. AIEA member Rahul Choudaha was quoted in the article "US colleges fret over fall in Chinese students" on China.org.cn. AIEA President Cheryl Matherly and Past Presidents William Brustein and Susan Buck Sutton presented at the IIE Summit 2019 along with members Mark Algren, Tim Barnes, Angela Bell, Rajika Bhandari, McKenna Brown, Mary Catherine Chase, Dan Davidson, Jennifer Engel, Cheryl Francisconi, Athena Fulay, Jane Gatewood, Wondwossen Gebreyes, Andrew Gordon, Gundolf Graml, Stephen Hanson, Donald Hempson, Chad Hoseth, Dale LaFleur, Rick Lee, Wesley Milner, Rick Nader, Clare Overmann, Suzanne Panferov Reese, Joanna Regulska, and Don Rubin. Member institutions Agnes Scott College, Lehigh University, the University of Evansville, and the University of South Florida were named among the Heiskell Award Winners at the IIE Summit 2019. AIEA member Rahul Choudaha was interviewed on immigration policy for the U.S. News and World Report article "Immigration Sting Could Hurt U.S. Reputation" and the PIE News article "US: Fake 'Uni' Sting Could Harm Int'l Numbers." As detailed by the Times of India, AIEA member Jun Liu met with leaders from Panjab University to discuss Stony Brook University and PU's Joint Institute of Sustainability Development. In an article published by CNBC-TV18, AIEA member Rahul Choudaha examined the study-abroad trends of students from India. Choudaha was also interviewed by Business in Vancouver on the effects of the Huawei backlash on international education in British Columbia. AIEA member Rahul Choudaha was interviewed by The PIE News on international student enrollment in the United States. AIEA board member Torian Lee was recognized by Mayor LaToya Cantrell of New Orleans and the mayor's Office of International Relations as part of the city's International Education Day event. 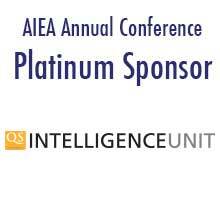 AIEA Members Megan Gibbons, Ricardo Castro-Salazar, Martha Johnson, Joel Gallegos, John Stauff, and Ilir Zherka are all slated to present at CIEE in November. Members Chris Cartwright, Joseph Hoff, and Stephanie Doscher presented at the IUPI Assessment Institute, while Past President Gil Latz served as Global Learning Track Coordinator. Members Shawn Conner-Rondot and Angela Miller also attended. Executive Director Darla K. Deardorff presented at the REIES 2018 Conference in Quito, Ecuador. The conference theme was Comprehensive Internationalization: Key Issues y Decisive Resources for Ecuadorian Higher Education. Around 30 institutions attended the conference at the National Polytechnic School. AIEA member institution Xavier University of Louisiana featured in recent article in Inside Higher Education on study abroad at Historically Black Colleges and Universities (HBCUs). NAFSA: Sara Allaei, Patricia Bello, Susan Bender, Rajika Bhandari, Thomas Bogenschild, Lucia Brajkovic, Jennifer Campbell, Robin Catmur, Amy Conger, Anne D’Angelo, Jennifer Evanuik, Jermain Griffin, Patricia Juza, George Kacenga, Kelechi Kalu, Megan Lawther, Jin Li, Kim McGrath, Angela Miller, Angelina Palumbo, Judith Pennywell, Laura Rumbley, Christina Sanchez, R. Anderson Sutton, Willis Wang, Wesley Young, Jiangyuan Zhou, Linda Angell, Shingo Ashizawa, Britta Baron, Brett Berquist, Steven Boyd, Roger Brindley, William Brustein, Ryan Buck, Jennifer Creamer, Darla Deardorff, David Di Maria, Dudley Doane, Angelle Edwards, Ivor Emmanuel, Joel Gallegos, Jane Gatewood, Amy Henry, Victoria Jones, Hilary Kahn, Ling LeBeau, Jun Liu, Jesse Lutabingwa, Mihaela Metianu, Allen Miller, Woody Pelton, Sabine Pendl, Penelope Pynes, Amy Rell, Amir Reza, Charlie Schwartz, Maria Soloeta, Jon Stauff, Brenda Tooley, Jewell Winn, Chunsheng Zhang, Pamela Barrett, Rahul Choudaha, Mike Nieto, Ben Waxman, Lindsay Addington, Cherly Delk-Le Good, Andrew Gordon, Dawn Whitehead, Ian Wright, Ilir Zherka, and Susan Sutton. The Forum on Education Abroad: Jose B. Alvarez, Anne D’Angelo, Zachary Frieders, Jason Kinnear, Patrick Morgan, John Singleton, Roger Adkins, Steve Bell, Elizabeth Brewer, Darla Deardorff, Ryan Dye, Adam Henry, Jane Kucko, Kate Patch, Penelope Pynes, Margaret Wiedenhoeft, Joan Gillespie, and Brian Whalen. Diversity Abroad: Sentwali Bakari, Stephanie Doscher, Martha Johnson, Hilary Landorf, Megan Lawther, Torian Lee, Elaine Meyer Lee, Shannon Marquez, Amir Reza, and Dawn Whitehead. APAIE: Shingo Ashizawa, Katherine Belov, Brett Berquist, Eric Bullard, Thomas Buntru, Rahul Choudaha, Darla Deardorff, Simon Evans, Jane Gatewood, Bronwyn Jenkins-Deas, Nico Jooste, Douglas Proctor, Peter Mascher, Anne Pakir, Leonie Patrick, Douglas Proctor, Penelope Pynes, Joanna Regulska, Janaka Ruwanpura, Robin Sakamoto, Trine Sand, George Sipos, and Michael Wilhelm. FAUBAI: Angelle Edwards and Peter Mascher. Congratulations to AIEA Member Rahul Choudaha on the publishing of A Third Wave of International Student Mobility: Global Competitiveness and American Higher Education by Berkeley’s Center for Studies in Higher Education. Congratulations also to AIEA Past President Gil Latz on receiving the Global Citizen Award from Texas Tech University. Congratulations to AIEA member institutions Babson College, Stony Brook University, Texas Tech University, and the University of Florida for receiving the 2018 NAFSA Simon Award for Comprehensive Internationalization. Congratulations also to the University of Georgia on receiving the NAFSA Senator Paul Simon Spotlight Award. Many congratulations to AIEA member Miriam Kazanjian on receiving the Modern Language Association/Association of Departments of Foreign Languages "Award for Distinguished Service to the Profession." AIEA Executive Director Darla K. Deardorff published blog in Education Weekly titled "How To Assess Global Competence." Congratulations to AIEA members Adam Henry and Melanie Gottlieb for publishing articles in the Spring 2018 IIE Networker Magazine. AIEA member Rahul Choudaha's article “How the US can stem decline in international students” published in University World News. AIEA member Elaine Meyer-Lee is presenting at the 2017 IAU Conference in Accra, Ghana (October 17-20). AIEA members Stephanie Doscher, Jeffrey Hamilton, Matthew Jacobs, Hilary Landorf, Susan Sutton, and Dawn Whitehead are presenting at AAC&U’s Network for Academic Renewal Conference in New Orleans, Louisiana (October 12-14). AIEA members Leslie A. Bozeman, Chris T. Cartwright, Madeleine F. Green are presenting at the 27th IUPUI Assessment Institute (October 22-24) in Indianapolis, Indiana. AIEA members Chris Cartwright, Natalia Dyba, Hsiu-Zu Ho, and Ilir Zherka are presenting at the 2017 CIEE Annual Conference (November 8-11) in Austin, Texas. AIEA members Cheryl Matherly and Margaret Everett were both published in Fall 2017 edition of the IIE Networker. AIEA Past President Gil Latz presented at ACE Executive Forum.